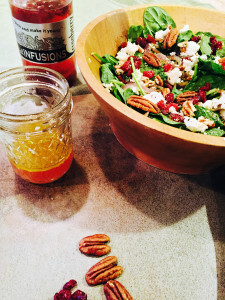 Shake things up and infuse some vinegar with rokz infusion kits to make outstanding dressings for summer salads. Using the rokz Citrus Blue Infusion kit, add 12 oz. of a good quality aged Basalmic Vinegar to the bottle and shake well. Let it infuse for 4-5 days. Combine all ingredients in a mason jar, put the lid on tight and shake. Trim and Cut in half 1 pound fresh Brussel Sprouts, toss with 1 Tbls Citrus Blue Vinaigrette roast in the oven. Roast 1 pound fresh beets. Combine Beets and 3 oz of Citrus Blue Vinaigrette. Mix well, so all the beets are coated. 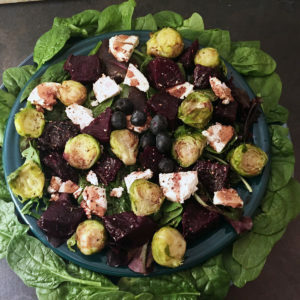 Be sure to use separate bowls or beets will “bleed” all over the Brussel Sprouts. Just before serving, combine the two, and add another 2 oz. of the vinaigrette. Lightly toss and top with Fresh Chevre or other soft goat cheese. Add fresh ground pepper and more vinaigrette if needed. Serve warm or cold, and it tastes great served with fresh baby spinach. For advice on how to roast beets, check out this resource. For advice on how to roast Brussel sprouts, visit this website. Using the rokz Cranberry Infusion kit, add 12 ounces of Golden Balsamic to the bottle and shake well. Let it infuse for 4 days. When the Balsamic Vinegar and cranberries combine you end up with a brilliant red vinegar ready for all kinds of gourmet salads. Using the rokz Ginger Cardamom Infusion kit, add 12 oz. apple cider vinegar to the bottle and shake well. Let it infuse for 4 days. 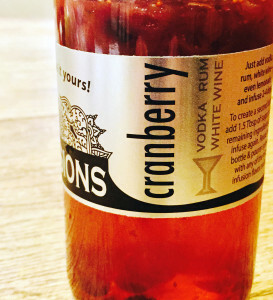 For a milder flavor, you can use rice wine vinegar, but we prefer the tang of the cider. Marinate 2 boneless skinless chicken breasts in 2 Tbsp Ginger Cardamom Vinegar, 1 Tbsp soy sauce, 1 Tbsp brown sugar, and the juice of one lime or 2 Tbsp lime juice. Grill on BBQ until it reaches 165 degrees internally. Set aside, slice when cool and store in a container in the refrigerator until you make your salad. 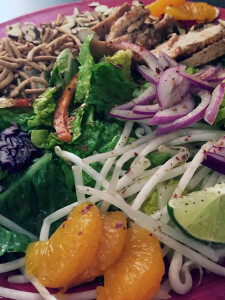 Start with romaine lettuce on the bottom, add your toppings, and drizzle on your vinaigrette. 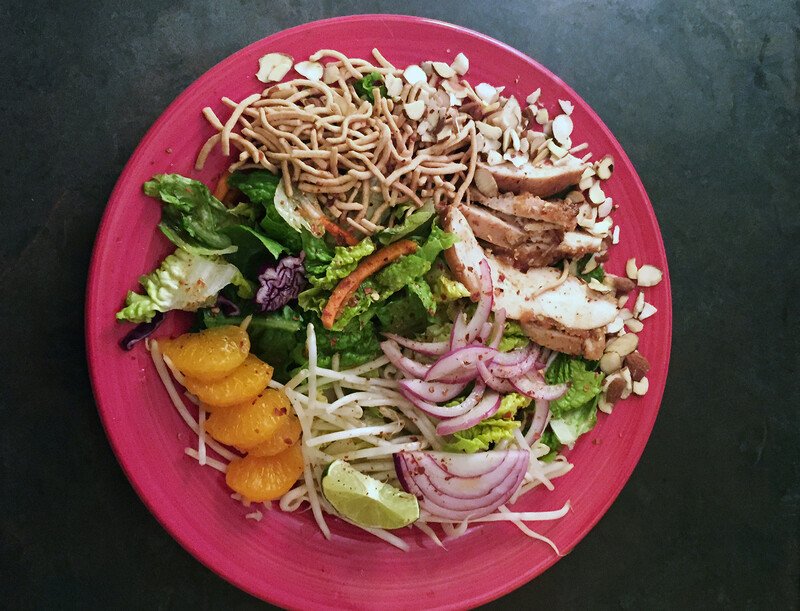 We used the following: Red onion, mandarin oranges, crispy chow mein noodles, toasted sliced almonds, mung bean sprouts, scallions, and fresh lime and Ginger Cardamom grilled chicken. This is a pretty well-known salad but what makes it stand out is this vinaigrette. It adds the perfect spice combination to make it taste super delectable.